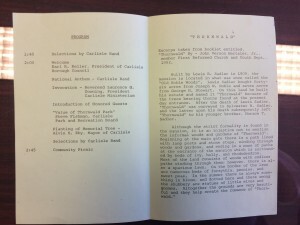 In 1975 the Carlisle Borough bought the 35 acres of land from the Carlisle School District who had purchased it three years earlier with the intention of building a middle school on the grounds. Largely due to public resistance to the idea, the School District decided to sell the land. 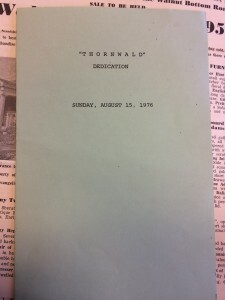 In August of 1976, the land purchased by the Carlisle Borough was dedicated as Thornwald Park, keeping the original Thornwald name given to the land and mansion by the Sadler family. The president of the Carlisle Borough Council, Earl R. Keller, designated the land as a park with the moment being memorialized by the planting of a tree on the park’s land(1). 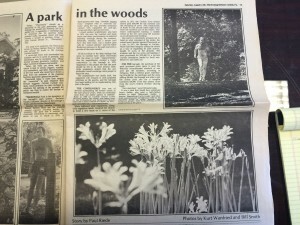 By 1981 Thornwald Park was established as a well-visited public area known for its running trails, exercise spaces and open lawn areas. Accounts tell of the populized trails being filled with “sweaty joggers” and the grassy areas filled with “scantily clad sunbathers”(2). 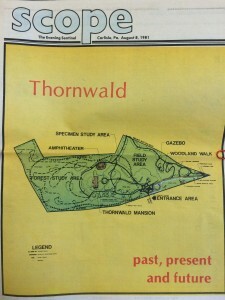 The newspaper article found in The Evening Sentinel Paper, The Scope, discusses the clear difference found on the grounds of Thornwald in the late 20th century compared to its earlier years. The author, Paul Riede, discusses how the estate’s walls are no longer standing and exercise activities of the public are a contrast to the former secluded natural formality of the land when it was an estate. Riede points out that the land is no longer a monument to the golden age of leisurely living and wealth present in the last generation, but instead “Thornwald Park is the showpiece of the Borough’s park system”(3). The “Swedish jogging trails” used by the public were built in 1979, and were three quarters of a mile long. The trails remain today. Accompanying the trails and for the use of “ambitious runners”, were thirteen excursive stations used for pull-ups and sit-ups (2). 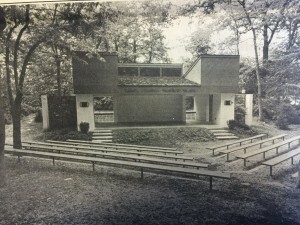 Also in 1979 a small amphitheater was built near the mansion itself and was used for musical and dance performance for the public. The amphitheater is still in use today and provides similar entertainment and public use.